2 Weeks ago today Parker went home to see Jesus and Brisan. I like to say he is experiencing the ultimate vacation package. 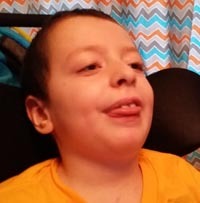 We can only imagine the joy he is having with no more Niemann-Pick and his earthly inabilities that prevented him from experiencing a typical childhood. They only have a childhood to live a lifetime is a very true and stark reality now that we’ve come full circle. What can we really say other than “did this really happen”? We love you Parker! No words can accurately describe how we are feeling right now. All this in under a year. Who would have thunk it.